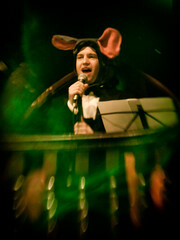 The Halloween weekend saw me in Edinburgh at Dr Jekyll's Nightmare, performing a song about a nightmare about rats. I'll put the song online soon. I'm particularly fond of rhyming "why not us?" with "riotous". The show went well, but I was far too tired to enjoy it fully. This last weekend saw me back in Coventry, briefly. I helped make a pattern for a shirt, I prepared a miniature art gallery and I chased a rabbit. All in all, a pretty good weekend.